The Kenyon College Rev. 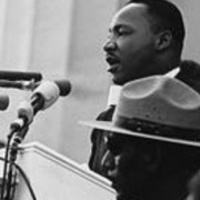 Martin Luther King Jr. Day of Dialogue highlights his legacy and connects it to current issues that affect the campus and the world. The 2019 keynote speaker will be Dr. Leslie Harris, professor of history at Northwestern University, whose talk is titled, "Community is a Verb: Access and Equity in Higher Education." The 16th annual celebration breakfast will also take place on Monday, Jan. 21, 2019. Classes will operate on an adjusted schedule.